Baby Hazel has a new friend who just moved to town, Akito, and today is his birthday. She wants him to feel welcome so she decides to organize a surprise party in his honor. Help her navigate through this endeavor as she gathers what she needs to put it all together. 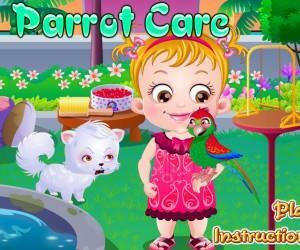 The game-play offers users a basic understanding of interactivity and as the character moves through her adventure it can also serve as an educational tool, examples of responsibility and generosity. Ultimately the score is determined by how quickly you make and keep Baby Hazel happy, shown as a meter at the top. There are guiding hands along the way to help the user through each level. Be sure to complete tasks as quickly as possible, take too much time and she’ll start to cry, and use left-click to engage an object or character. There are four stages, each one progressing Baby Hazel closer to Akito’s party. To advance through the levels the user must interact with the environment and move characters through it. Stage one is in her home. She’s getting distracted playing with her pets and she has forgotten that Akito’s birthday is today. Follow the hints to help her focus and grab items before she can go to the store. Stage two is traveling to and from the store. Hail cabs, pick out the right supplies required for the party, and don’t forget to pay before leaving! Stage three is at home setting up for the party. 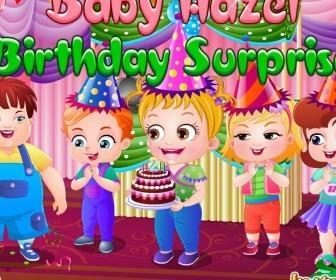 Help Baby Hazel and her friends decorate the room and prepare for Akito’s entrance, and don’t forget to help those pesky cats. Stage four is the party! Akito has arrived and Baby Hazel needs to be a good host for him and his friends. Cut cake for the birthday boy, pass out party hats, and dance, dance, dance. Happy birthday Akito! 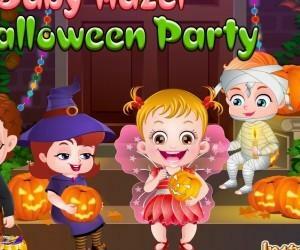 Use mouse to interact with Baby Hazel and her friend. Enjoy!